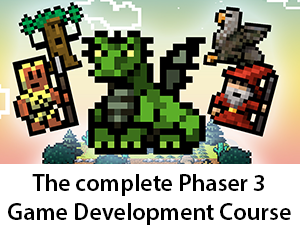 Phaser is free and open-source and always will be. But we also sell a range of books and plugins to enhance your development skills. Letting you code faster and make better games. 400 pages of detailed articles, tutorials and guides. With full source and graphics. Create an HTML5 Vertical Endless Runner cross-platform game using Phaser and only free software. Learn how to create a fully featured 2D platform game, how to make it mobile friendly, and port it to iOS and Android in this top-selling book. Learn the complete process of creating a procedural endless runner game, with full source code.